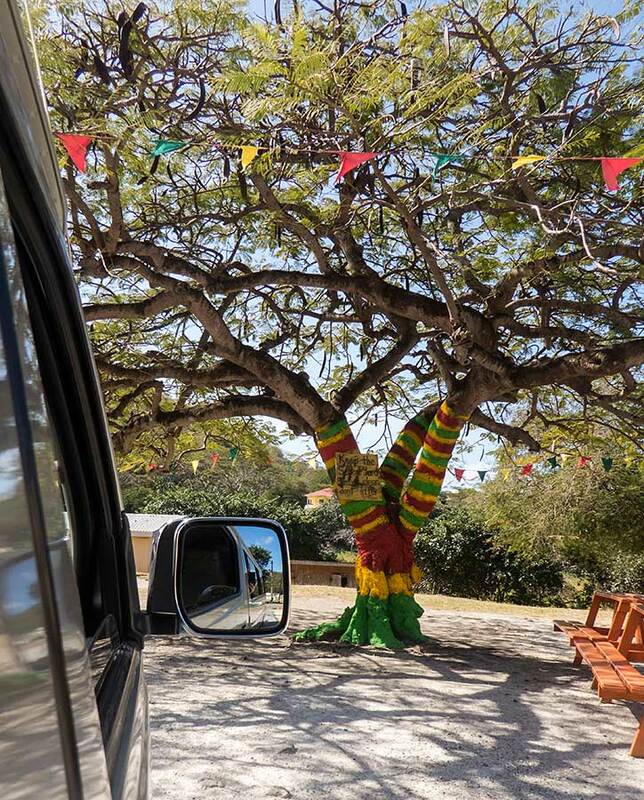 Carriacou is a big change from Trinidad. 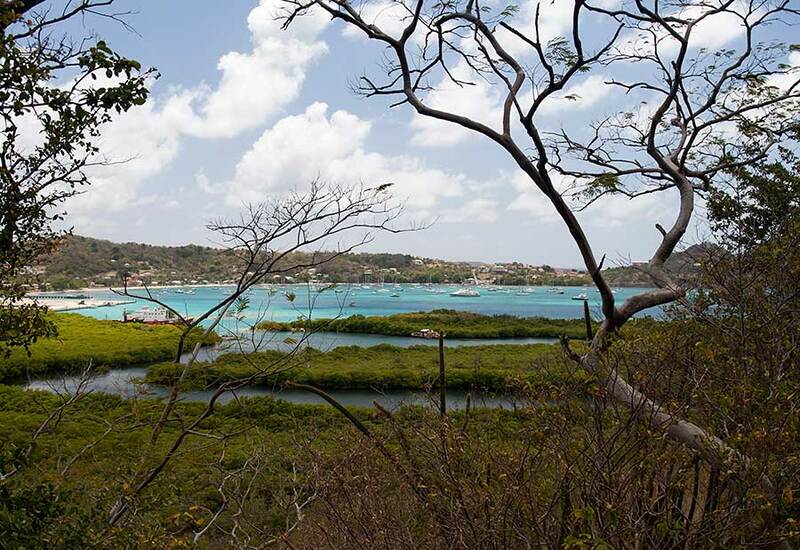 The island is small with only about 8,000 population and the pace of life much less hectic. Yachtie and diving tourism are important to them and the breezy climate is pleasant. While Trinidadians are usually friendly and chatty they can sometimes be quite stroppy or just disinterested. 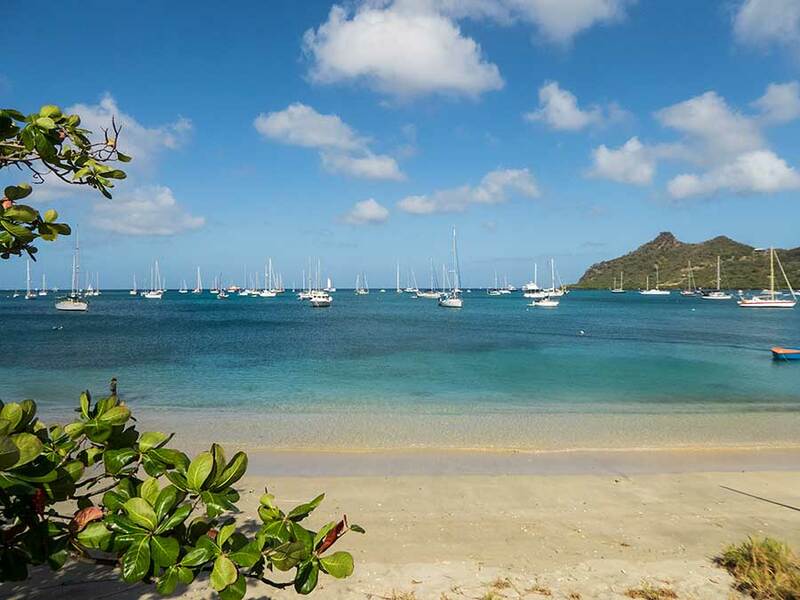 We learned to live with that but in Carriacou people are incredibly friendly and helpful, including the minibus drivers who come down to the dinghy dock and help you tie up in order to get your business! We hired a car and drove around the island on a couple of days. The roads are not well signposted and tend to peter out becoming dirt tracks so you need a 4x4 and a good sense of direction. 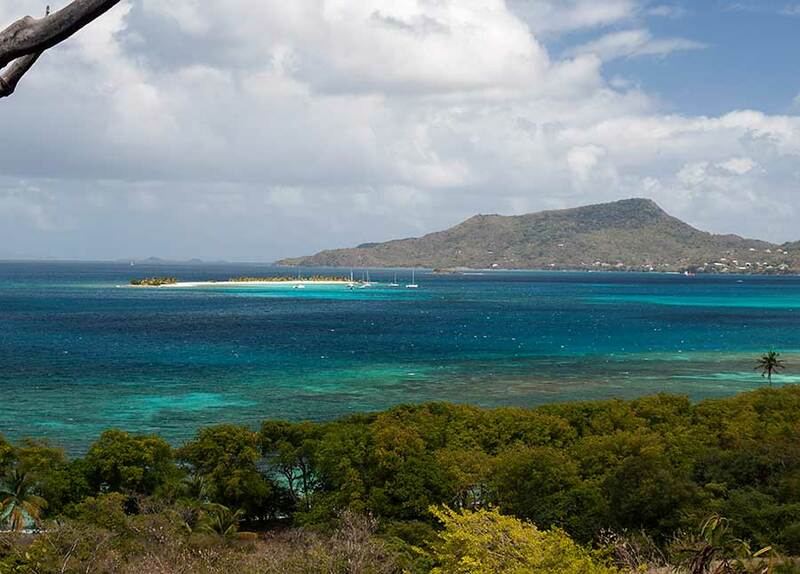 We managed to find quite a few of the high spots from which to admire the surrounding Grenadine islands and reefs, but the skies were hazy so we couldn't see very far. Other than tourism there is little industry on the island and not a lot of agriculture because water is scarce, especially now we are in the dry season. 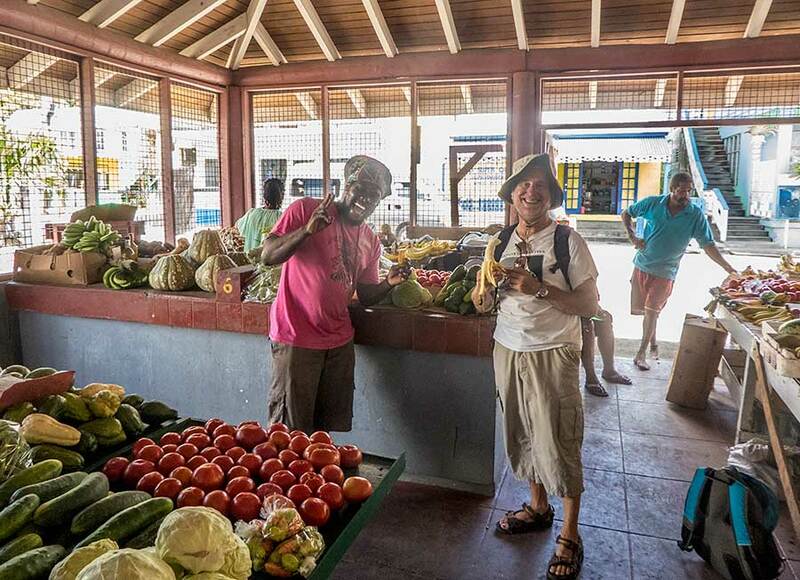 The local produce is quite expensive but tasty: delicious bananas, papaya, mango and other fruits depending on the season. While in Trinidad we loved the range of food on offer, including "roti" - spicy veg and meat or fish wrapped in a flatbread - which has east indian origins. We were pleased to find it here as well. 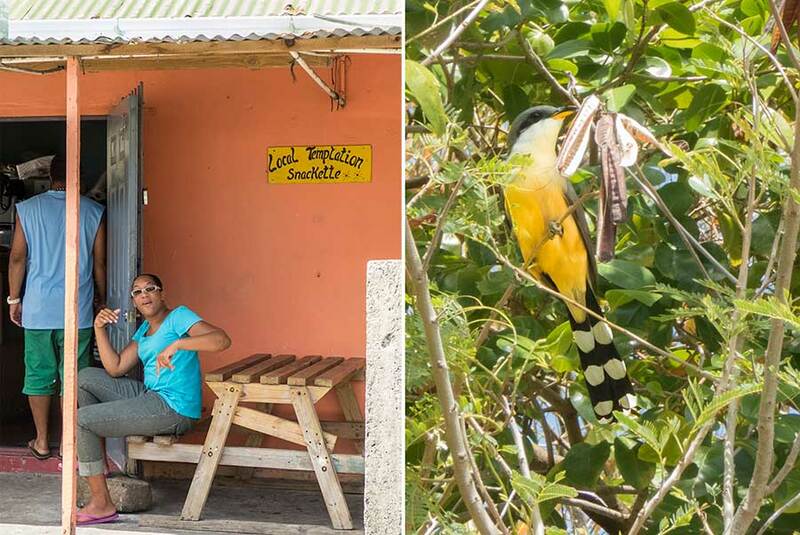 There are plenty of goats on the island and a few cows but the main restaurant offerings are chicken and fish, sometimes also lobster and lambi (conch). After 10 days in Tyrrel (often spelt Tyrell - and we never did find out which is correct) Bay, we checked out and sailed north. 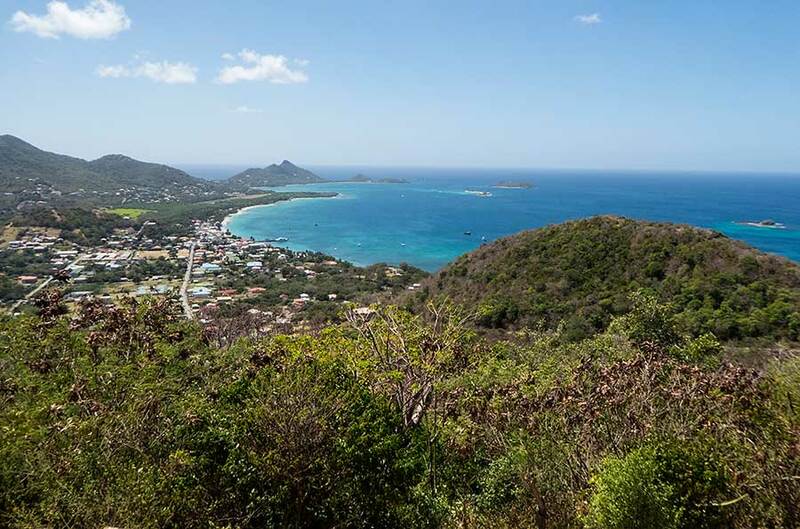 Carriacou is a dependency of Grenada, within the Grenadines - the group of small islands between Grenada and St Vincent - and so we crossed the international border to enter the territory of St Vincent. Thankfully the process of checking-in is fairly painless - just one form to fill in, stamps in our passports and money handed over for a month's cruising permit. Checking out was similar, without the payment. 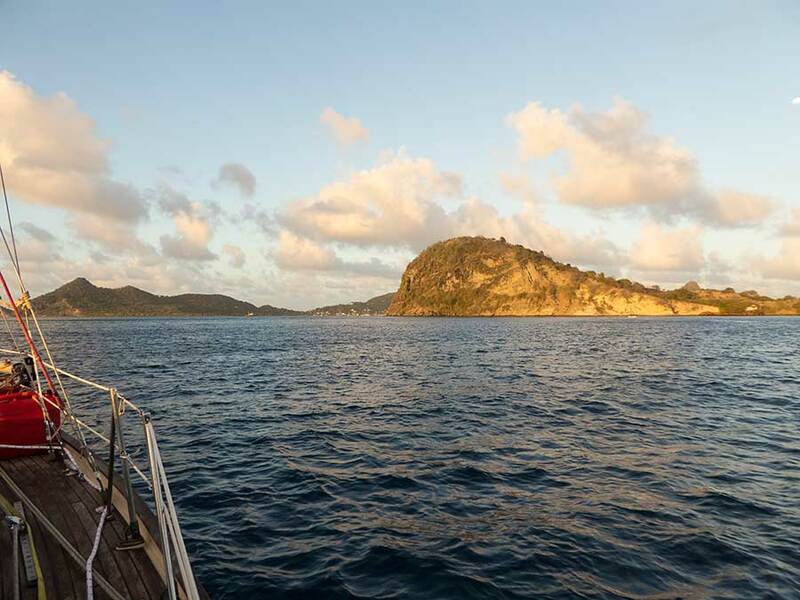 We entered Charlestown Bay on Canouan and anchored off, a little bit apprehensive because of reports of theft from yachts in the anchorage. 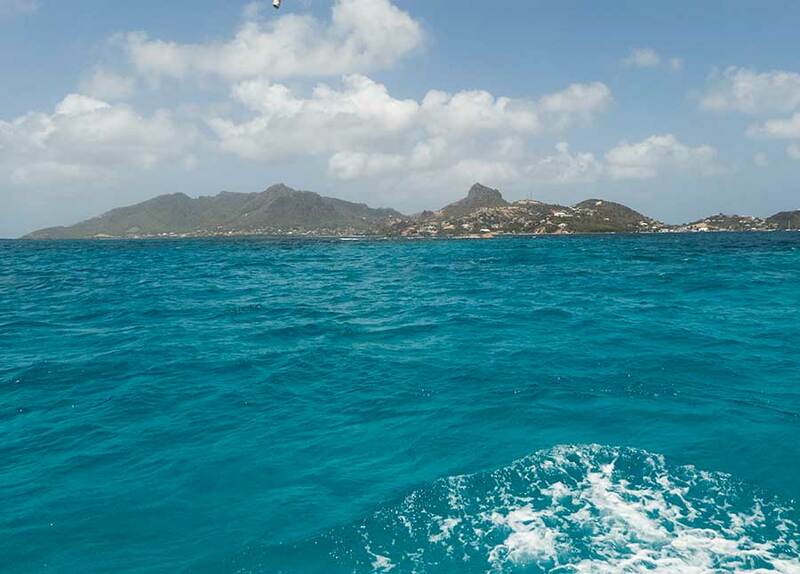 We were greeted by boatmen offering the usual - ice, water and fuel - and a friendly "welcome to Canouan". They advised us to land our dinghy at the nearby hotel jetty. 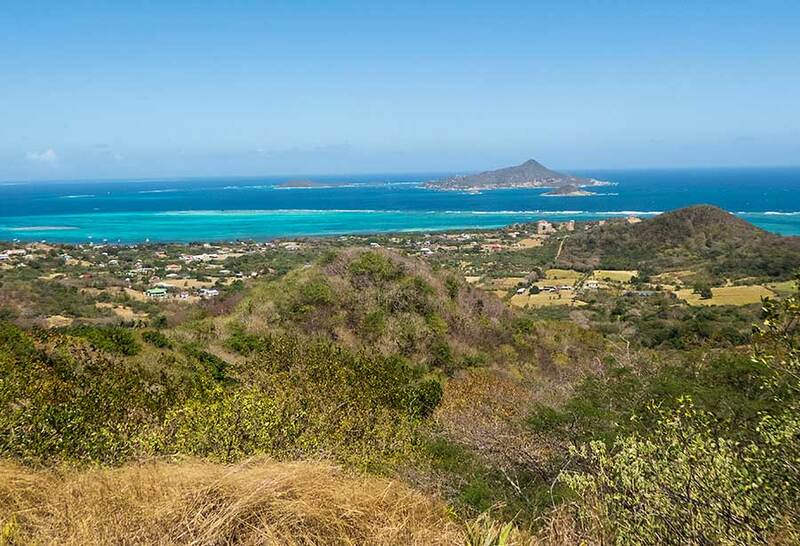 Canouan is a small island with a luxury gated community in the north and not a lot to do other than walks. 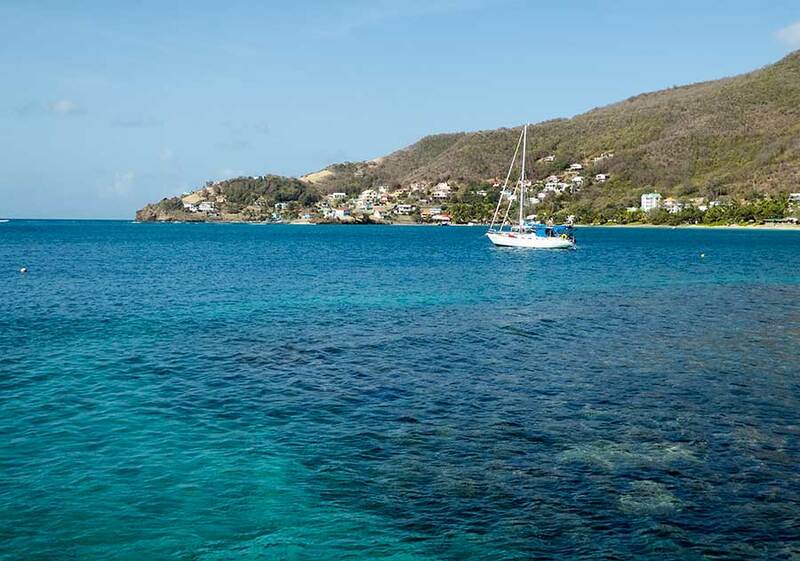 We were only planning to stay overnight but wanted to go ashore to check-in to St Vincent. To guard against theft we cleared the decks, stowed everything below and locked all the hatches before launching the dinghy. From the hotel jetty it was a short walk into "town" and the local administrative building where immigration and customs were to be found. We had to wait a short while for customs but the officials were the friendliest we've experienced since Angra dos Reis. Again, one form completed and a payment to customs then a stamp for immigration and we were ready to hoist our St Vincent courtesy flag. That evening we dined at the hotel bar, after watching the sunset over a beer and rum punch. The hotel seemed almost empty but the food was very good and the service excellent. There were just one or two other yachts in the anchorage . 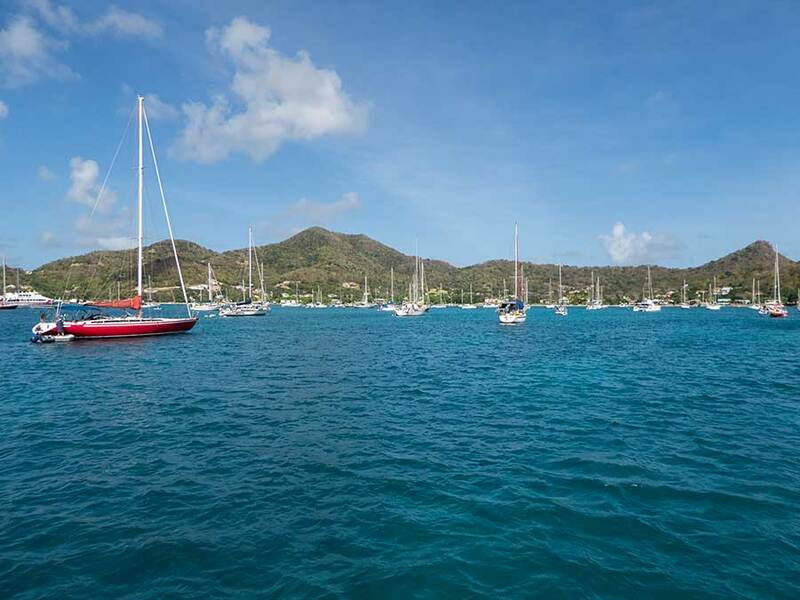 The next morning we sailed north to Bequia (pronounced Bekway). Again we had pleasant conditions, with easterly winds and moderate seas. 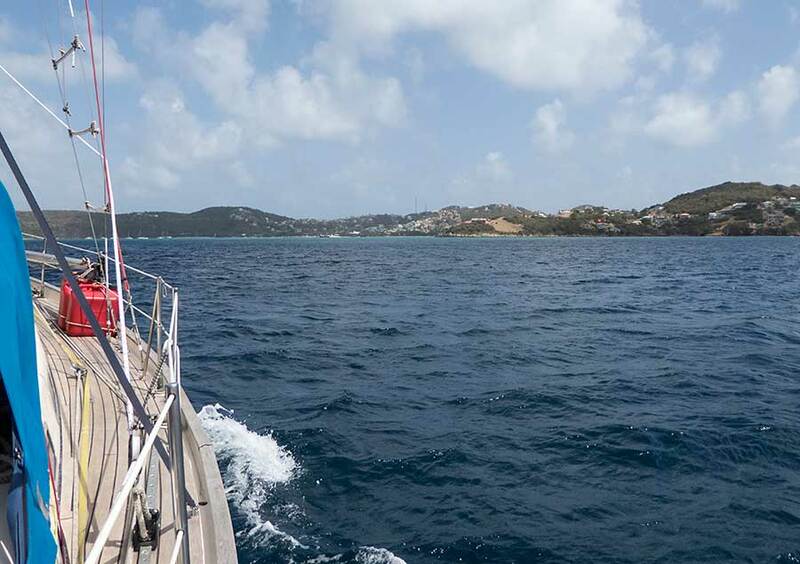 We kept to windward, sailing close-hauled most of the way with the island of Mustique - of Princess Margaret, Mick Jagger, et al fame - to our leeward. On approaching Bequia we headed for Friendship Bay on the south side of the island, passing Petit Nevis where the whale catch (sadly it can still happen here) is slaughtered. 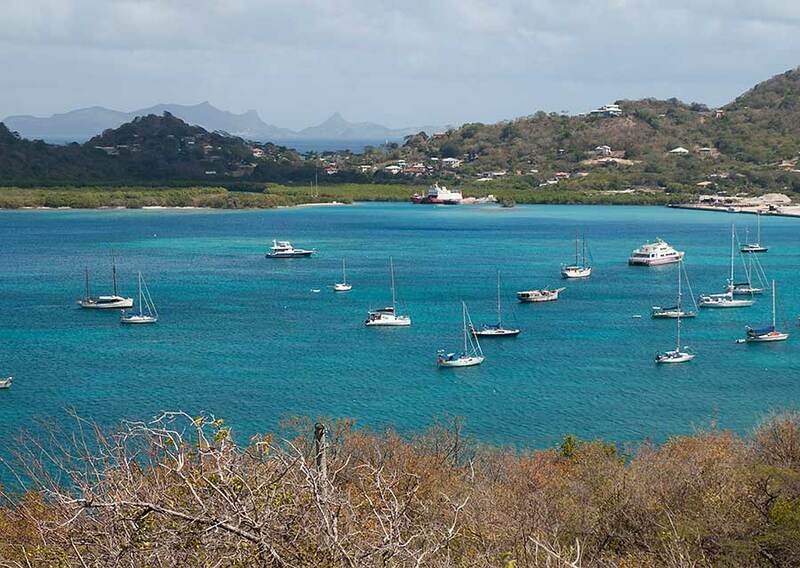 For tourism Bequia is far more popular than it's parent island, St Vincent. The main harbour of Admiralty Bay and the town of Port Elizabeth (many British resonances here) are teeming with yachts, cruise ships, their crews and passengers. The locals do their best to make the most of this. We were lucky in our choice of Friendship Bay (every island seems to have a bay named Friendship and we've yet to establish why - and we haven't met any Quakers). It is well-sheltered and has little ashore except for a posh hotel. All we had to do to become comfortable was to deploy a second anchor to line us up to the swell. Perhaps the swell, which can cause quite a tiresome roll on monohulls, is what puts other yachts off, apart from the lack of shops. We have a reef just a hundred feet away that has the best snorkelling we've experienced for a long, long time (since the Seychelles). On Thursday we went ashore and caught the bus to Port Elizabeth for shopping. The Rasta market was quite an experience: good fruit and vegetables but sold with an aggression that is very off-putting. Elsewhere shops sell gourmet foods and knick-knacks. The Bequians are well practiced at extracting real (US) or local (East Caribbean) dollars from visitors.